It was the seminary on Sheridan. No, not Garrett. The other one. The one across the street. Until 2009, Seabury Hall, now known as 2122 Sheridan, was home to the Seabury- Western Theological Seminary, an Episcopal divinity school. Seabury-Western was born from a merger between Seabury Divinity School and Western Theological Seminary in 1933. The campus took up most of a city block (creatively dubbed “the block”) but throughout the years, it educated, fed and housed between 50 and 100 students per year, their families and faculty. Seabury Hall, added in 1956, provided a student commons, more classrooms and more library space to the campus. 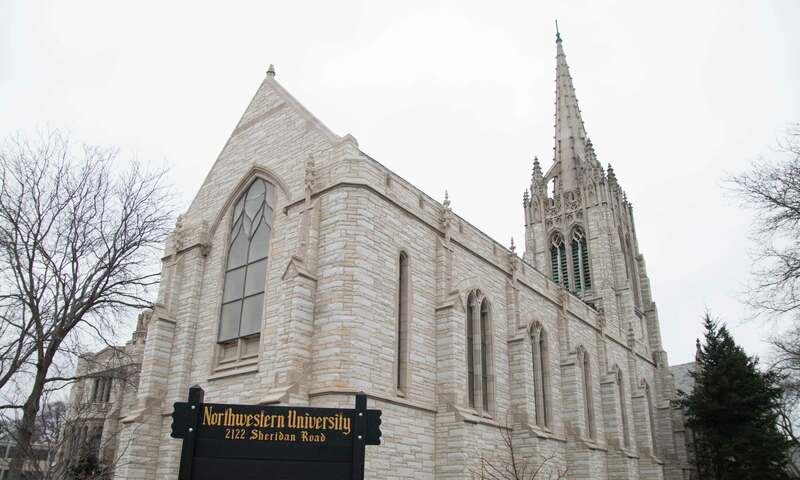 The seminary chugged along under the radar as Northwestern University grew up around it, offering students a variety of religious graduate programs that changed in name, curriculum, rigor, prestige and demand over time. Seabury-Western students were called juniors, middlers and seniors and took classes like Elementary Greek, the Planning and Composition of Sermons and Psychology of Religion during their own version of the quarter system, known as Michaelmas, Epiphany and Easter terms (with an optional Trinity term in the summer). They were also cross-registered at Northwestern until World War II. Seabury-Western students had access to Northwestern and Garrett-Evangelical Theological Seminary library collections, but they also had stacks and collections of their own. Before Northwestern turned it into a hodgepodge of storage and empty space, the Seabury Hall basement was home to thousands of books. A bragging point for Seabury-Western was its Hibbard Egyptian Library, hidden away in a side hallway on the second floor. Gifted to Western Theological Seminary by Lydia Beekman Hibbard (a wealthy Episcopalian Chicagoan), the collection included books about ancient Egypt and Assyria as well as a first-century Egyptian “portrait mummy” of a 5-year-old girl with a painted face, found in 1911 in Hawara, Egypt. Garrett would later buy the entirety of Seabury-Western’s library collection, and you can now visit Hibbard’s mummy in Garrett’s United Library on Sheridan. 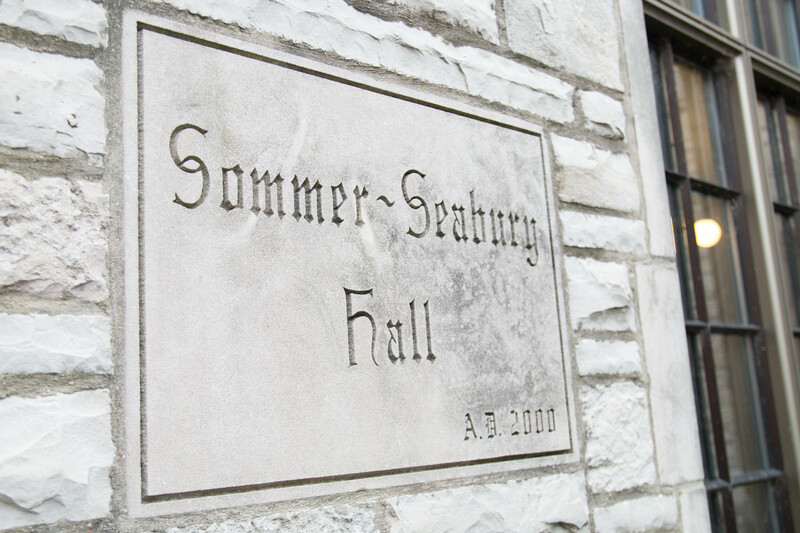 By the 2000s, Seabury-Western began to feel the hurt from their relatively small endowment, and by 2008, Northwestern was leasing space in Seabury-Western for dorms. In 2009, Seabury-Western stopped accepting new Masters of Divinity students (called “MDiv,” it was Seabury-Western’s main program and the first academic stepping stone to becoming a priest). It then began selling its remaining property to Northwestern and phased out of Evanston. According to former Seabury-Western librarian Newland Smith, their endowment of $10 million paled in comparison to other seminaries (the Virginia Theological Seminary, one of the more successful Episcopal seminaries in America, has an endowment of around $140 million). 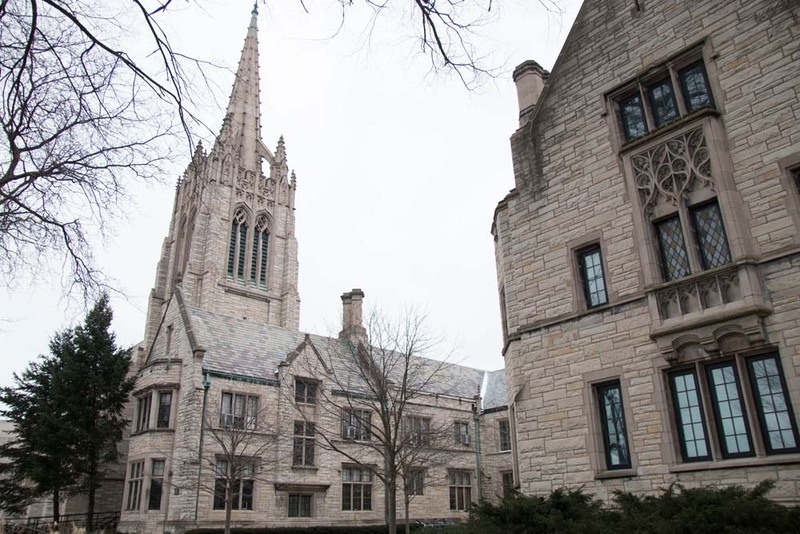 The seminary’s future was in limbo until 2013, when it announced a merger with Bexley Hall from Columbus, Ohio, another economically failing Episcopal seminary, and established its current campus in Chicago’s Hyde Park. 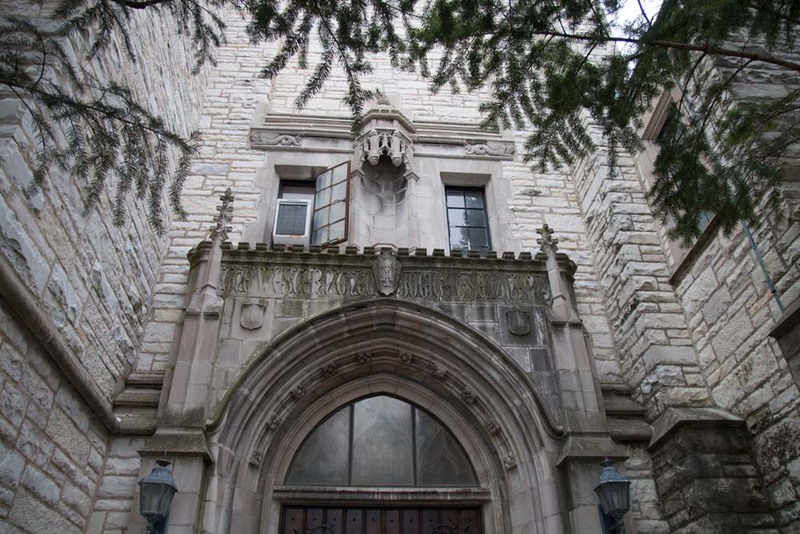 For a while, Northwestern didn’t seem to know what to do with Seabury Hall. It functioned as a subpar dorm for a couple dozen students (24, according to its old Wildcat Connection page) for a few years before the university carried out massive renovations and rebranded it as 2122 Sheridan. It reopened in 2014 as office space, and the last few stragglers moved out of the dorms shortly after. The steeple is now silent, and the Hibbard Egyptian Library is empty and locked away from the world. 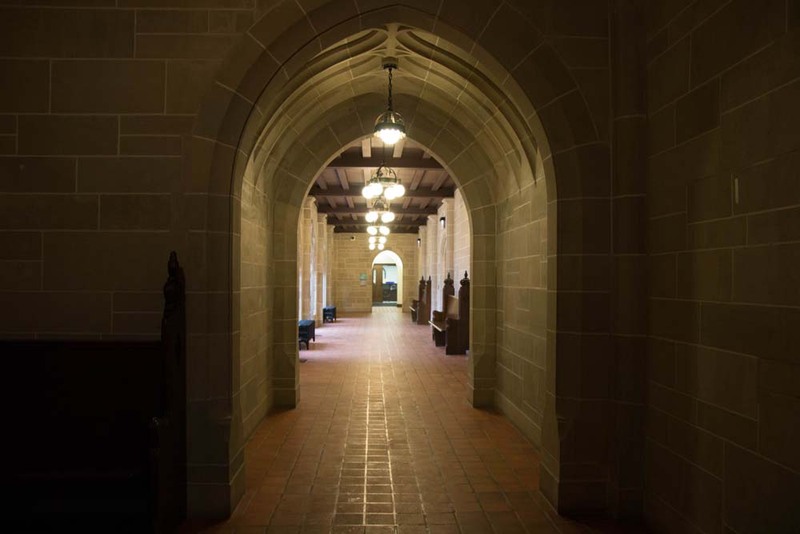 The only remnants of Seabury-Western’s organs are the pipes that stick out in the Performance Hall – according to Smith, one of the organs was from the 1933 World’s Fair and was “too large” for the space, and the other is now in Alice Millar Chapel. Like a lot of architecture at Northwestern, Seabury Hall is gothic and pointy, dotted with intricate stained glass and open archways. From the outside, it looks like a chapel. And from the inside, it also kind of looks like a chapel. Pews, not benches, provide seating in its brightly lit hallways and the inconspicuous, frosted windows on the outside are bright stained glass works of art on the inside. 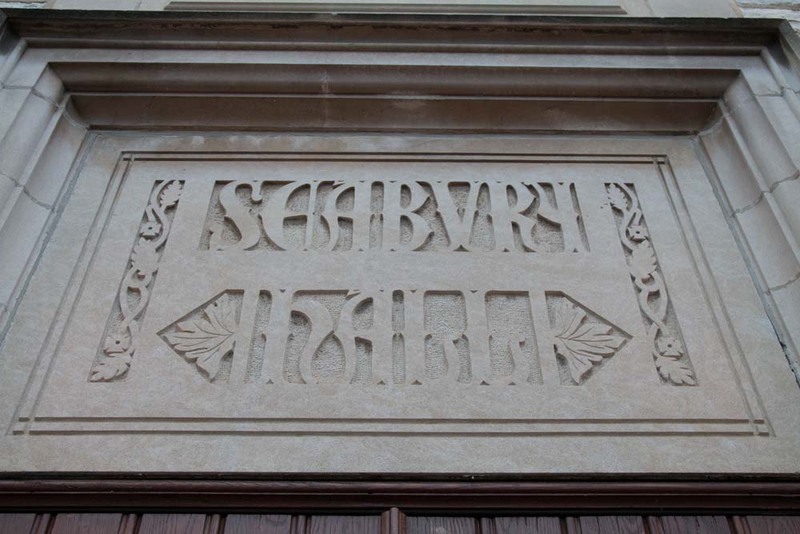 Back in its heyday, the 2122 Performance Space was Seabury-Western’s Anderson Chapel, a memorial to Right Reverend Charles Palmerston Anderson, the Episcopalian Bishop of Chicago for 30 years. Not only was it named after Anderson, but it was also Anderson’s postmortem home for several decades. 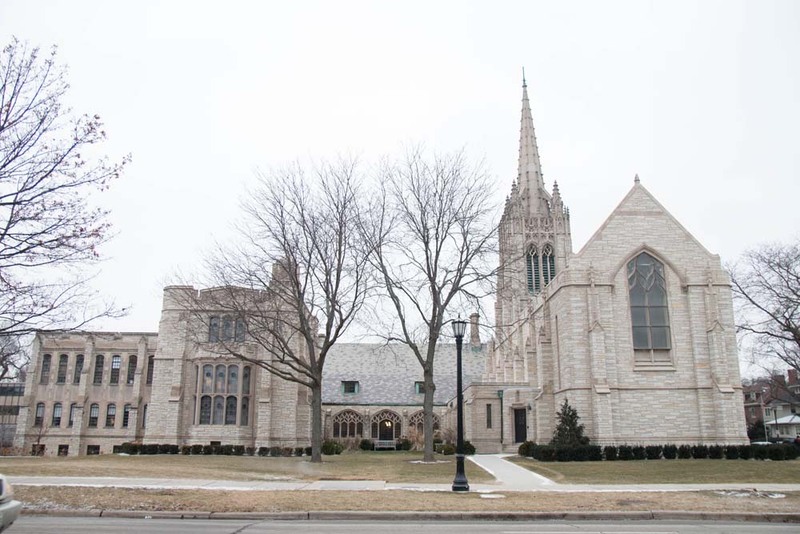 According to the Chicago Tribune in 1930, Anderson was buried “in a crypt beneath the plain marble altar in the chapel.” He, and later his wife, remained under the chapel until his family moved them to Wisconsin before Northwestern took over, according to Smith. No longer a burial ground (as far as NBN knows), Seabury Hall is now home to a myriad of NU offices like Residential Services, Residential Academic Initiatives and AccessibleNU, with classrooms on the second floor and the Performance Hall on the ground level. A hallway connects it to 600 Haven Street, another former Seabury-Western building. 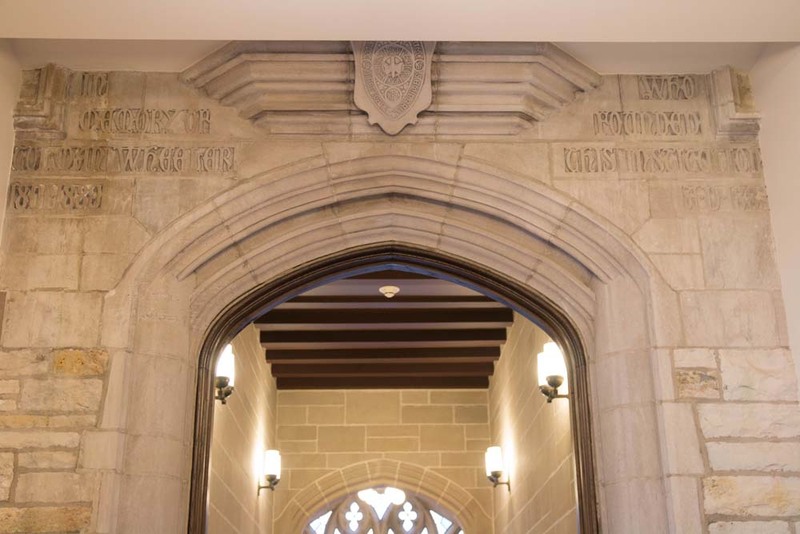 The Gregory Reading Room, a study room under Seabury-Western, is now The Graduate School commons, and the large, Hogwarts-esque study tables now reside in Garrett’s United Library. Northwestern students occasionally wander into 2122, maybe looking for an office or hidden classroom. It’s disconnected enough from the east side of Sheridan that sometimes NU servers think you’re connecting from off campus. Its combination of regal exterior and sleek, modern interior – with a dash of vintage church – make it a unique, albeit slightly confusing, building to navigate. The days of the Northwestern Fighting Methodists are long gone, but at 2122 Sheridan, a hidden theological past flickers on.